Every software engineer tries to become a programmer and dreamed of being a good programmer in his life, they live to fulfil the dream of being a good programmer. Programming is one of the most versatile things in the current age where you do not need anything extraordinary to learn. The problem arises when you have qualifications, but lack in the knowledge department. The field of programming has been just like math, right tricks and techniques needed to learn in order to succeed, otherwise, you will be stuck in the beginning and feel hard to find a way out. Programming is logical, creative and ever changing, the scope of programming is never going to go out and there are still many jobs that required good programming skills and in exchange pay you really well. So now the question is how to become a good programmer? Because having knowledge or qualification is not just enough, you must know how to work through it with success. 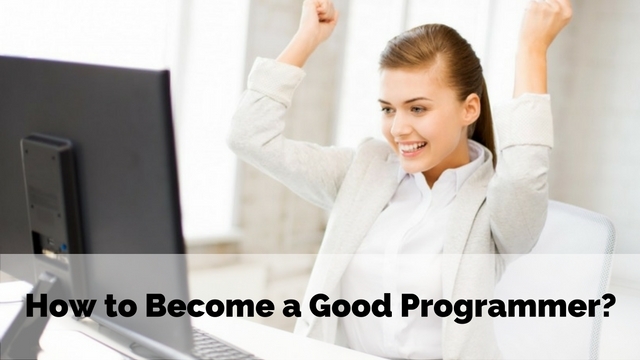 The following mentioned are few programming tips to become a good programmer and ways on how to learn programming. There are few things about the programming language that you got to learn at the beginning when you start from the basic. These basics of programming is used everywhere, no matter the programming language you are using whether it is an object-oriented programming language or procedure oriented language. Actually, the basics of a programming language are important simply because they are used interchangeably for almost all the programming languages, whether it is Java, Dot Net or any other language that dominates the current programming world. So the first step you take towards being a professional programmer is to learn the basics and familiarise with their uses and places where they are used. There are a few basics that change with the language as well, so you really need backup on basics to be a good programmer. If you are thinking, learning C, C++, Java, etc. will help you to become a programmer then you are totally mistaken because there are things other than languages that play a huge role in the life of a programmer. A programmer is called good only when he has an understanding of such concepts. These concepts are important, complicated and need to learn, but they work like a math question, all in a systematic manner. A data structure, algorithms, flow chart etc are few of the terms that follow good programming and help a programmer to develop a code that can meet the requirement of their client. So to be a good programmer, don’t forget this little help that goes along with you for the long run as well as helps you to become a programmer. Coding can be a really interesting part of being a programmer but it totally depends on the choice of your heart that what interest you the most, still coding is one of the creative parts of programming where you use coding tips to create what it is in your mind. If you want to be a good programmer then you should experiment with your programming. You can do the experiments on various online portals or on your own system where you experiment with your coding. The experiment doesn’t mean mismatching irrelevant things together, it means that you create different code in the language you are using to check the functionality of the code as well as got to learn few important lessons of coding, no teacher can teach you in the class. The experiment is the biggest teacher if you really want to know how things work and how to be a person that knows what he/she doing with their life. A great saying is that “read widely and broadly” which mean you should be open for reading as much as possible and reading means good stuff about coding and programming. Especially, reading is important for adults, students and children.The benefits of reading are world known, people understand the power of reading as it gives you the knowledge that no school, college ever taught you. So grow the habit of reading a lot about a programming language, new technologies because reading is the only way you can have good information as well as got to know various things, you may ignore them otherwise. Reading not only just gives you information, but also sharpens your instincts and you know some of the things you have no idea about via books. So read the good stuff about programming because it’s going to really help you in becoming a good programmer. Good programming codes is much better than wasting time over things that are out of your hand. The field of programming is so wide that you may feel neglected or your knowledge seems just a tiny part of the whole story. There is so much to learn and go through that if you try to learn everything you will feel overwhelmed or have a hard time taking everything in. When you become a programmer and choose one field of programming language to be the major of your career then you should do the analysis, an analysis of what you know and what you need to learn in order to be a good programmer. You can try online material available to check your knowledge or go through the tests that check how much you know about the language you are choosing as main for your career like Java, Dot Net, etc. because there is so much more than what we learn in our college. A programmer never satisfies or stops learning throughout his life and he is never the master or the programmer who knows everything because there is still things that you can learn and work on. A good programmer never stops learning and searching because there is so much more to learn, to know and to use it for the better. There are people out there who know lots and lots of things because they never stop learning and searching, which take them higher and higher in their respective field. If you want to be a good programmer who has good command over the coding skills and the best programming language, then start to search and learn in your free time. You can start with the learning of the problem you usually face while working and then move on to more complicated parts. The programmers who actually write better, meaningful codes are those who know their way around the language and other things that need to write an effective code. A meaningful code takes time and energy as well as a brainstorm to be meaningful enough to use in the actual software or something. There are so many things in the coding like testing, debugging, error detection and removing of error that really helps you in learning. A good programmer knows his way around the coding, no matter the area of coding he is working on. When you try different aspects of coding, you get to know different things like how other programmers form their codes, what technique they are using and how effective their methods are. Debugging, testing helps you a lot to become a programmer. The ever changing world never stops for anyone, not even for a programmer. Programming language comes and goes, that’s why you should learn as much as possible about the language, frameworks, coding structure and how exactly they work and help till the new one replaces them. Techniques of programming world change with time in order to find the best one so that it becomes easier to handle complicated task because as with the technology, complication are also growing and we need better than before every time a change happen. As a good programmer, you should learn techniques, not the tools because when you know the existing techniques you adapt new one with little to no difficulties. If you think making mistakes is a bad thing, especially in the programming world, then you seriously need to restart your reevaluation as a programmer and learn that mistakes are the programmer’s best teacher because these mistakes make you learn are hard to find in any class. Make mistakes, rectify them and start again because your mistakes are your guidance to be a good programmer if you are not making any mistake, then it only means two things, first, you know everything and second you don’t know anything and just copying and pasting other’s work. So never hesitate of making mistakes and learn from them. Testing is one of the smartest ways to be a good programmer. If you think a tester doesn’t do anything, then you are wrong because if you know your way around the testing and actually can test the code for errors, then you really need lots of things because it is one thing to write a code but another to find the errors and rectify them. If you want to be a good programmer then test your own code, just doing testing for your career is one thing but testing your own code for error is another. When you do testing of your code you learn the mistakes you made and learn how to solve them, which ultimately helps when you produce code next time. Practice makes a man perfect and in this case, goof programming practices makes you a good programmer. Do practice, a lot of them if you want to be a good programmer because the practice is the only proved solution of the problem ‘ how to become a programmer ’ because the practice is the only thing that makes you a good programmer. The things we had discussed till now, all the above things are only possible if you do practice again and again. There is always something to learn, something to know no matter how much you learn. So do practice, give practice tests, engage yourself in competitive practice sets because that way you learn programming more and know more and all this hard work helped to become a programmer. Changes are inevitable and constant, changes are the universal fact that is bound to happen no matter what. If you think changing is worse then look around and see the change we humans have made in last few decades. Change in the programming world is bound to happen, new technologies are bound to replace the old one, so why to hesitate from the change. So use change to your advantage by improving your programming skills.To be a good programmer be ready for the changes and accept them with the grace and ready to learn whatever changes through your way. You are not the only one who wants to be a good programmer; there are people like you out there and working hard to be a good programmer. Be in touch with your fellow programmers who work with you, you can also find people like you online, where there are many websites that help you bring together and you have healthy discussions over coding and programming tricks that help in improving your knowledge and you get to know different things from the others. You also know the problems others are facing and how they deal with them, so take time from your busy schedule and be in touch with other programmers. Programming field is so big that there are endless opportunities to learn and grow. A good programmer always learns from each mistake and failure that come and interrupt. In this article, we had discussed how to become a programmer and we really hope it really helps you in your journey.